Tsitsikamma, aptly named "place of many waters" by the ancient San people, is part of South Africa's famous Garden Route. Situated at the heart of the region, Tsitsikamma boasts spectacular scenery including high mountains, indigenous forests, unspoiled stands of the Cape's unique fynbos, rivers that carve their way to the Indian Ocean through rocky ravines, spectacular waterfalls and white sandy beaches. 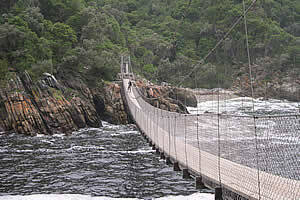 The magnificent and unique coastal Tsitsikamma National Park runs along 67km of wild and beautiful coastline. On land it is 1.6km wide but it reaches a further 800 meters out to sea, thus encompassing both marine and terrestrial ecosystems as they meet at the shoreline. Of particular interest to the marine biologist, a fascinating complex of climatic and geological influences is at work here. In general, this is a dramatically steep shore, swept by powerful waves which make life perpetually insecure for the intertidal creatures. Thus a wealth of those animals which specialize in hanging onto rocks for their livelihood occurs. Nine species of limpet alone are found here, from the rosy-flecked Patella miniata to the giant P. tabularis. Many animals flourish both in size and in number, among them the alikreukel, a gourmet delicacy elsewhere but protected in South Africa, and filter-feeding creatures, notably mussels, barnacles, reef-forming tube worms and red-bait, all of which rely on the surging waves to deliver their food supply. The local birdlife, too, is abundant with more than 200 recorded species, including 35 types of seabirds. A good way to see many of these animals is to take the famous Otter Trail which runs the full length of the park from Nature's Valley to the Storms River mouth. The first trail of its kind in the country, it follows the shoreline closely. The route is marked out with otter emblems, includes four overnight huts and provides a three-to five-day walk through some of the country's finest coastal scenery. Its attractions include a number of cave middens, a guano cave, some spectacular waterfalls and perhaps even a glimpse of the shy animal after which the trail is named, the Cape clawless otter, a protected species which lives retiringly on crab, octopus and fish. A further feature of the route is the Underwater Trail. Laid out in a bay near Goudgate, this features interpretive underwater plaques and can be swum under the supervision of a trained diver and ecologist. 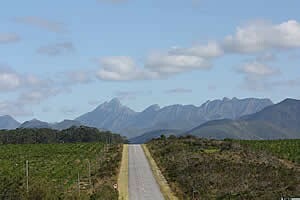 An extension and complement to the Coastal Park is the Tsitsikamma Forest National Park which runs parallel to it between the sea and the Tsitsikamma mountains. 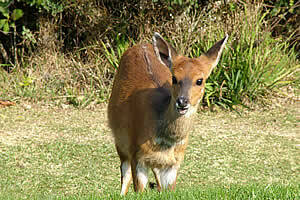 In the centre, near the mouth of the Storms River, is a camp with a restaurant, bungalows and caravan park. Swimming, fishing and walking are the chief pastimes here. In the pools along the coast is an abundance of marine life. The Otter Trail hiking path runs along the southern length of the park. There are huts for overnight stops and the coastal scenery is a delight with wild flowers, birds and other wild life. The walk requires three days. A field museum at the mouth of the Storms River displays relics of the prehistoric beachcombers who lived on the coast. In the forest there are several massive trees the tallest of which is 36 meters high and some of which are reputedly 1000 years old. 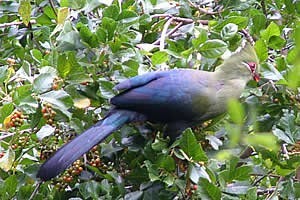 There are more than 30 species of indigenous trees, ferns and climbers and such rare birds as the Knysna loerie and the Narina trogon may also be seen in the forest. 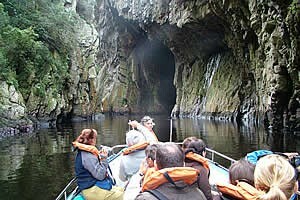 The formidable gorge of the Storms River is spanned by the spectacular Paul Sauer Brdige, which was opened in 1964. It is 191 meters long and 130 meters above the river. This concrete bridge, designed by Ricardo Morandi of Rome, is built on the principle of a castle draw-bridge. Two sections were hinged onto a platform on each side of the river and lowered to meet in the centre. 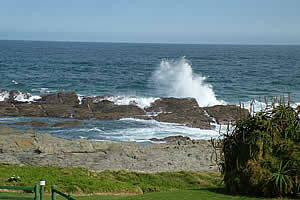 Not to be confused with Storms River Mouth, Storms River Village is the hub of adventure tours. From lazy and laid back to extreme and exciting, here you can choose from dozens of activities. Explore the the indigenous forests from high on a Tree Top Canopy Tour or take the more sedate route with a tractor trailer ride on a Woodcutter's Journey. Take a guided walk or a challenging mountain bike ride in the forests or try your hand at bass and fly fishing. Bloukrans Bungee offers the highest commercial bungee jump in the world (at more than 200 meter free fall) or you can marvel at the engineering brilliance of the Bloukrans Bridge and its sheer beauty on a guided bridge walking tour. The bridge over the 216m deep Bloukrans Gorge is the highest bridge in Africa. Here you will also find the Tsitsikamma Khoisan Cultural Village.